How does your team work together? Is there trust and collaboration? Or is there poor communication and frequent conflict? You could be a group of the most qualified and hard-working individuals, but if there is a lack of cooperation you will struggle to meet your common goals and the business could suffer. 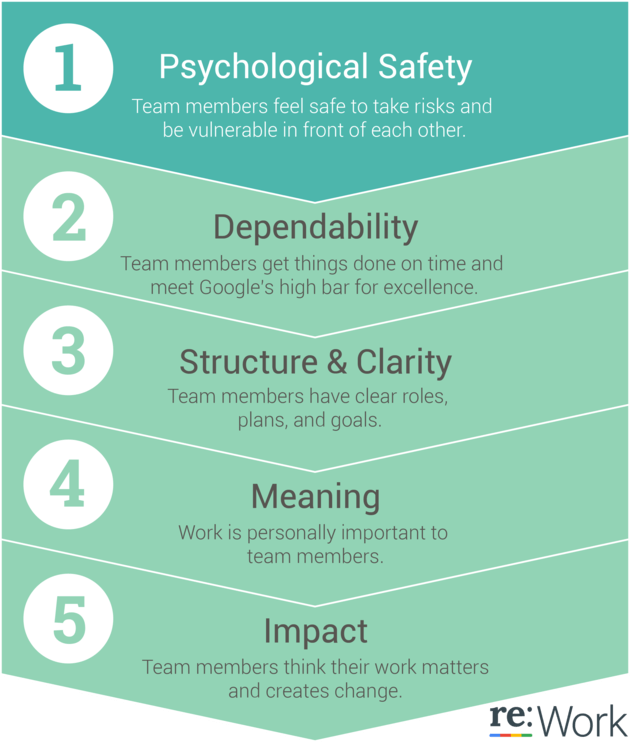 Google recently conducted a study to find out just what it takes to be a successful team, interviewing 200 of their employees over the space of 2 years, to identify some of the common attributes and skills their staff possess. Here are some of the top traits they found make for a productive and harmonious team at work. How many of these apply to your team? It is important that your team trust all trust one another and you feel comfortable in each other’s company. Team members must feel safe to take risks, suggest new ideas, or express their opinions. Not feeling comfortable to do so can lead to low contribution from certain members who could offer valuable and creative suggestions. When there is a deadline to be met, it is essential that all team members can rely on others to get their share of the work done on time and to a good standard. It is the whole team that will be held accountable for poor time management or sloppy work, so you want to know that no one member is going to needlessly let the team down in any way. If you set clear team goals and plans then everyone has a specific focus at work. You can help each member to concentrate on the task in hand, or general running of the company by assigning specific roles and jobs among the group, so that everyone knows where they fit in. If your team do not have an interest in the work you are doing, or aren’t enjoying their job for one reason or another, then it’s likely they may lack enthusiasm and focus. Allowing each member of the team to have a say about what they would enjoy working on the most, to give their work a bit more meaning. Nobody wants to be the office skivvy, so make sure everyone is given important tasks that directly impact the success of the business or project. Appreciating hard work will also make your team members feel more valued.